Shri Infratech Vedic City is a unique integrated township brand at Greater Noida. Vedic City Plots Greater Noida is the city of many cities is all set to change the very definition of integrated township spread across 580 acres. Shri Infratech Vedic City Plots are located within township, Greater Noida. Owning the peace of land in Vedic City is a pride. Vedic City Plots give you the choices to choose from 153, 194 and 240 sq. Yds. offering with world’s top notch amenities defining the project and give you the top facilities near by your home. The architectural theme is inspired by the glorious era of Indian history. A history that is filled with a higher form of culture, music and architecture. An era of king Ashoka, Chandragupta Maurya, Chanakya, Alexander the Great and the world inspiring Gautama Buddha. It was a time when India ruled the world in terms of culture and spiritual attainments of the highest order. We have embodied this spirit of our Golden Era and infused it with the most modern and environment-friendly sustainable eco-system that will again re-live a glory that was. 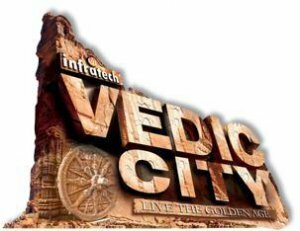 In today's "VEDIC CITY" you will find ultra-modern habitation and social infrastructure that will rival the best in the world. From tree-lined boulevards to serene botanical gardens, orchards, lakes and canals to enliven one's spirit. There will also be institutes of learning, medical facilities with super specialty hospitals, spiritual guidance centers, yoga ashrams, sporting facilities for body and mind, 'Helipads' for quick transportation and an electric commuting system through-out the integrated township.